Android is a complete Open source mobile platform built on the Linux 2.6 kernel that exposes a robust operating system, a comprehensive set of libraries, a rich multimedia user interface and a complete set of phone applications. We are among the early application developers for Google Android and with our experience of developing applications on a wide variety of platforms. Utilizing the complex Google Android SDK platform, our highly qualified Android application developers explore the unlimited possibilities of Android through its comprehensive set of development tools. Android is an Open Handset Alliance, which helps developers use Java programming language and create applications of different types. Android has rich support for Audio/Media types and Graphics and has support of its core library for developers to build third party applications. To know more about our Android application development methodologies or get an overview of the apps we have created so far, contact us . 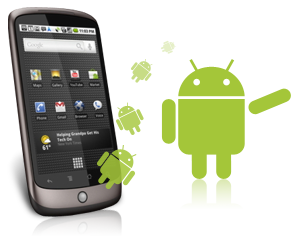 To get a free quote for Android app development, submit your requirements here.